OUR PRICE: $78.54 - Join Rewards Get $7 Dance Dollars On This Item! 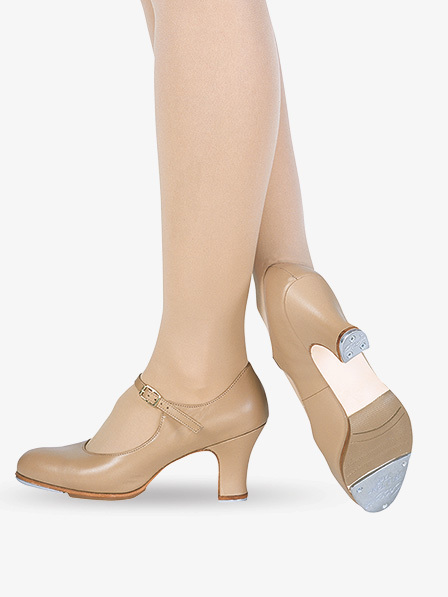 Capezio's "Manhattan Xtreme" tap shoe features a soft and durable leather upper, full leather lining, foam cushioned footbed and a non-slip heel counter. The 2 �" heel is fully wrapped in leather and it's flared design provide a larger strike zone for increased stability. Superior TeleTone toe and heel taps sit on a spring steel soundboard that allow sound to resonate and reach its "Xtreme" sound potential. Scored rubber sole patch for traction and control. They run a bit large in the width. I had to add holes in the strap to keep them on. They look good on my feet. I hate the rubber, tore it off and now the sound is much clearer. Overall I have had them a year and I was able to fix the problems I had with the shoe. I think these are great shoes for teaching musical tap, however, I would not want to teach studio tap in these. They fit well and are actually quite comfortable. Size not true for tiny feet! I love Capezio and own 3 other styles of dance shoes from them. My feet are rather tiny, but all my other Capezios are a 6W. Unfortunately, these tap shoes in a 6W are WAY TOO BIG! I am returning them for a smaller size and hoping they'll work better! So be cautious if you have smaller feet like me. I love these taps! Order a half size bigger than usual because these run very narrow. Great sound and style!! I'm ordinarily an 8 1/2 B shoe, but ordered a 9 C for this tap shoe -- and so glad I did! It fits just right, but would have been too short and too narrow in my regular size. Since the bottom sole in middle is rubber, maybe to prevent slipping), I find it hard to make a sharp sound when tapping with the toe, as I often hit some of the rubber, too, which stunts the sound. Maybe this shoe is for better tappers than I am. At any rate, it's a good shoe, and surely foxy looking! Thought seriously about going with a cheaper shoe but am glad I didn't. Perfect fit, just like street shoes. Very comfortable. Have gone through 2 pairs in less then a year. They are not durable, hence the reason why other reviewers say they break in so fast. If you are wearing them just for show they're appearance is great. If you are a hard-core tapper forget it. Impossible to do to stands in. Tried balancing on the heels and the whole back half squished into the shoe. This is a great shoe. It's durable and long lasting, the taps sound great, and it looks great. The only problem I have with this shoe is that the toe is bent upward and it is really hard to do standing toe taps because of it. Overall good shoe however. These shoes are amazing. After two or three classes I felt like they'd broken in enough to wear without stockings. It's a perfect heel height for auditions and looks great on feet big and small. These taps are wonderful for giving the look of lengthening the leg and slimming the foot. The sound is very strong. They do seem to scuff pretty easy because they were pretty messed up after only one recital. While you can't get rid of the scuffs, black shoe polish does wonders in reducing the visibility of the scuffs. The height of the heel took some getting used to, it was kind of hard on my ankles. Overall though, it's a nice shoe for Broadway type shows. These were comfortable right out of the box. I normally wear an 8 but I ordered an 8.5 W and they were perfect. My only complaint is that the sound isn't as true as my old Student Footlights, not sure what that is due to, but they sometimes sound almost muffled, not "extreme." Do the heels of this shoe break in well? I've had a hard time with the capezio 1 1/2" heel footlight taps having a heel that digs into my achilles tendon so hard it makes me bleed. I've never been able to soften them enough so they don't hurt. Because of this I've been wearing Bloch character shoes ever since because the leather is more pliable, but neither Bloch nor So Danca have a tap shoe with a 2 1/2" heel. 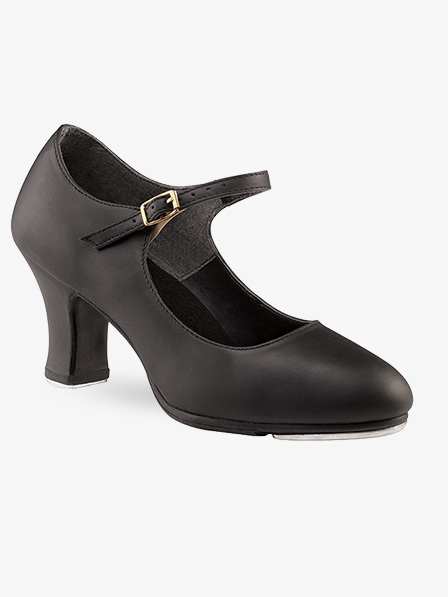 If the heel of this is soft enough not to dig and hurt my foot, I like these but if not I'd make due with So Danca's 2" heel taps. These shoes typically break in well after a week of solid wear. I own them, and have students who use them and none have had any major issues with them. They are a quality shoe. Does this shoe stretch a little bit? Since this shoe is made of leather, it will give a little bit over time. The taps on this shoe are removable taps. Is this considered a T-strap? This is not a T Strap, please see item C700, this is a T Strap.